Cutting edge contempo one-level home lies supremely secluded on quiet cul-de-sac. Completely remodeled with an extravagant open concept floor-plan ensures top notch entertaining and modern family needs. Sophistication is the key word in every part of this light filled home with city and harbor views. An enticing white on cool grey all quartz kitchen outfitted with large island and expansive cabinetry; plus convenient powder room with shower, walk-in pantry and adjacent laundry room. Dining area and living room divided by sculptural white tiled fireplace. Dark wood flooring throughout offers dramatic contrast to homes light palate. Three spacious bedrooms and bath line hallway with a sumptuous french doored master suite at the end of the hall. Master features include large walk-in closet with built-ins, and gorgeous all-white master bath with free-standing tub. Bring the outdoors in with expansive sliders onto an entirely enclosed large flat yard adorned with citrus trees and city light views. Lot extends to base of canyon providing privacy and rural charm. Finally, there's an approximately 150 sqft detached hobby/storage room with myriad uses. 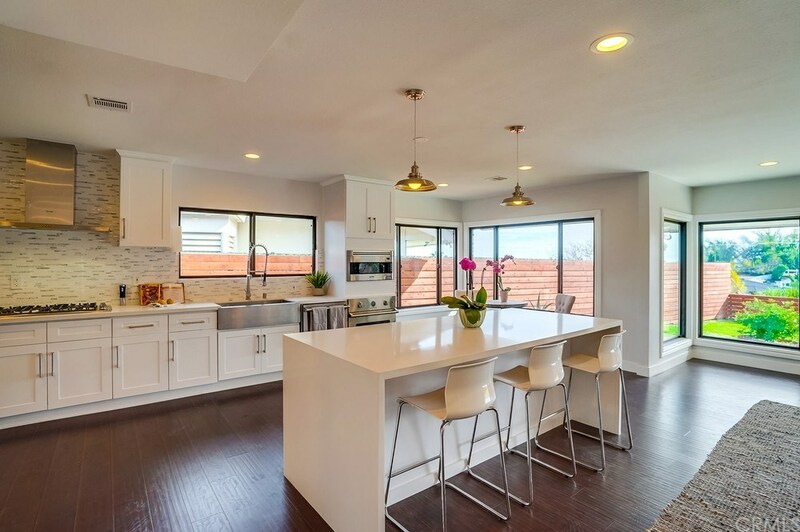 For the buyer seeking an enviable single-level home with unparalleled privacy, modern panache, and the award winning Palos Verdes school district, this home beckons.